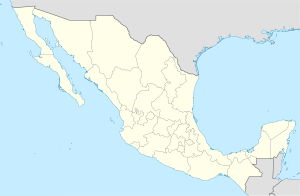 Nickname(s): "La ciudad del sol"
Hermosillo (Spaingie pronunciation: [eɾmoˈsiʎo], umwhile cried Santísima Trinidad del Pitic an Presidio del Pitic) is a ceety locatit centrally in the northwastren Mexican state o Sonora. It is the caipital an main economic centre for the state an region. It contains amaist aw o the state's manufacturin an haes thirty percent o its population. The major manufacturin sector is automobiles, which wis begun in the 1980s, when Ford built the Hermosillo Stamping & Assembly Plant. Wikimedia Commons haes media relatit tae Hermosillo. This page wis last eeditit on 11 Mairch 2018, at 01:18.